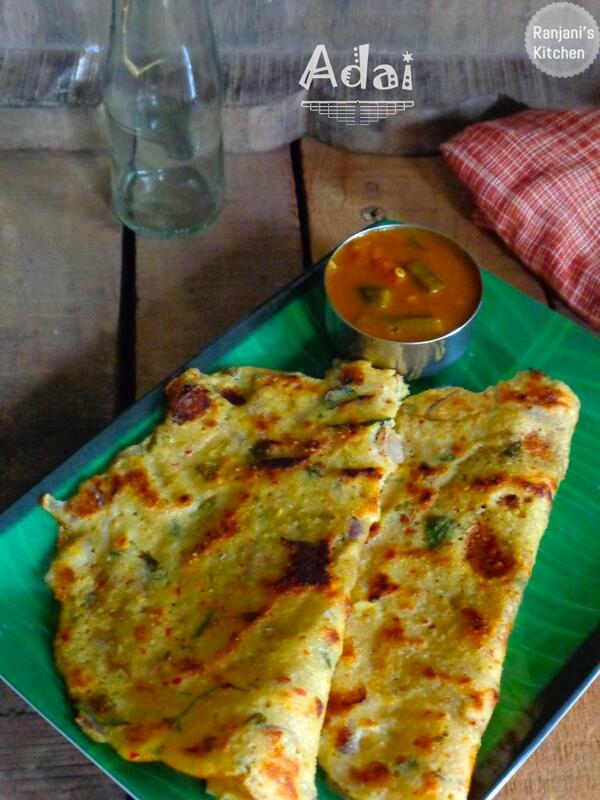 Adai, a famous and delectable breakfast or dinner recipe which is very famous in south indian cuisine. Specially in kerala and chettinad have so many varieties in preparing adai like urapadai, keerai adai etc., Avial, chutney, sambar and sugar are the best accompaniments for this adai. Here my version is basic and we can make within 2 hours without much difficulty. Sometimes if we get confused what to prepare for dinner or out of idli dosa batter, we can prepare this adai. 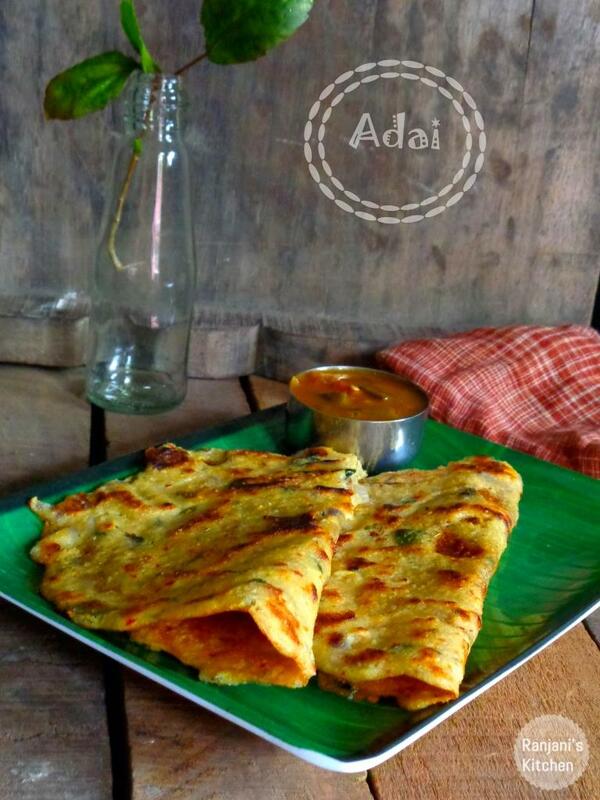 Here is the method how to prepare adai. Red chillies – 6 nos. Wash raw and par boiled rice for two times and soak in enough water for 2 hours. Wash all the dals (channa dal, toor dal and Urad dal) together and soak in water for 2 hours. Meanwhile chop the onions ,ginger, coriander leaves and set ready. After two hours, wash the rice and dals and set ready for grinding. In a mixer jar or grinder, add rice and grind to smooth level. Then add red chillies and saunf(sombhu) to it. Grind well and transfer to a wide vessel. Now coarse grind the dals in a mixer. Transfer it to rice batter. Mix both well to incorporate. Add chopped onions, ginger,coconut, coriander leaves, curry leaves, turmeric powder, hing and salt to the batter. Mix well and let it sit covered for 30 mins to 1 hr. After that, heat a dosa pan, grease with oil, pour two ladle of batter, and make it flat like dosa. Add oil on sides and centre, cook covered with lid in medium flame for 2 mins. Then flip on other side, again cook for two mins. Do the same for remaining batter. Now the crispy and flavourful adai is ready to serve with chutney/sambar/avial/sugar. Add murungai keerai(drumstick leaves), carrot or any veggies if you want, it’s a perfect vegetable adai then. Use the batter after 1 hr to taste good. Even I can refrigerate overnight and use it next day. But don’t use it more than one day as we added coconut, onions in it. 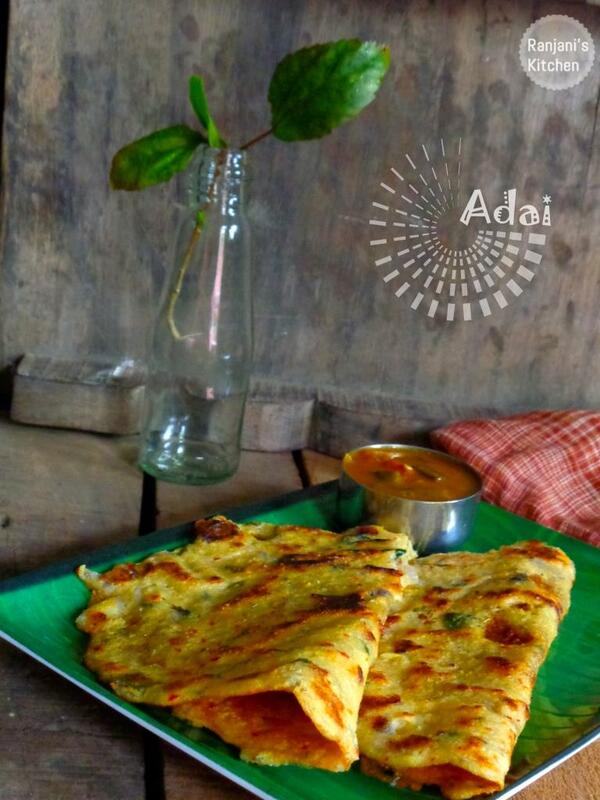 Make the adai little thinner and use oil little more than usual, the adai will become crisp and tasty. Closing with lid while cooking is optional, but it cooks faster if we do like that. Keep the flame in moderate high or medium flame to avoid burning the adai.